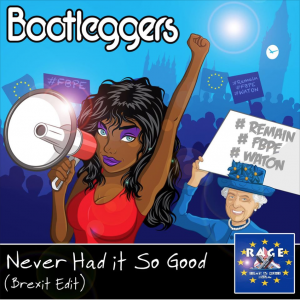 “Never Had It So Good” (Brexit Edit) is the latest release from Bootleggers under the Rage Against The Brexit Machine brand. Having previously fought against austerity on “Funkzilla: Boom or Bust”, the band couldn’t wait to take on Brexit, give it a good slapping, and give the Remain community a great big grin in the process. “We’ve never had it so bad – economic ruin, social destruction, health vandalism – all propped up by an ineffective opposition”. No Leave politician or government is safe from the fun-poking, thought-provoking lyrics. Bring on the next opportunity to vote out this mess! You’ll like this if you fondly remember the Pet Shop Boys, Erasure, and the Human League, or if you’re too young to, but love good music  Play it to your remain-voting gran – she’ll love it too!